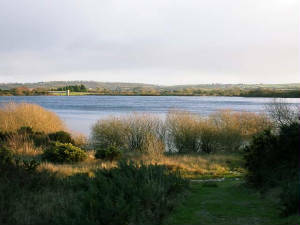 Habitat: Constructed reservoir but with 'natural' margins, including willow scrub. 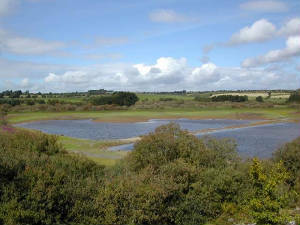 Main interest: Wintering & breeding waterfowl; passage waders; breeding warblers. Regular/annual: Little & Great Crested Grebe, common duck, Whooper Swan, Common & Green Sandpiper. Scarcer species & rarities: Red-throated Diver, Bewick's Swan, Shelduck, Gadwall, Pintail, Scaup, Ring-necked Duck, Long-tailed Duck, Buff-breasted Sandpiper, Little Stint, Ruff, Jack Snipe, Wood Sandpiper, Black Redstart. Highlights: Lesser Scaup (Nov 1999). Access: About 18 km from Waterford city and 30 km from Dungarvan, Ballyshunnock is best reached from the main Waterford-Cork road. From Waterford, turn right (left if coming from Dungarvan) at Carroll’s Cross to reach the lake and causeway, where good parking space is available. From Coolfin, go into Portlaw and take the road that leads left to the Catholic church up on the hill; from here Ballyshunnock is just 5 km away, straight on. Most of the lake margin is accessible when water levels are low, but avoid walking near the dense lakeside vegetation during April-July when waterfowl are nesting. The southern margin of the lake near the outflow (beside the tower) is out-of-bounds, but birds on the water can be viewed (at a distance) from the causeway. Visits in winter will always produce several species of duck, mainly Mallard, Teal, Tufted Duck and Pochard but occasionally Gadwall, Shoveler or Pintail. Long-tailed Duck, scarce visitors even on the Waterford coast, have turned up here on several occasions. Rarities too are recorded, like the Ring-necked Duck on two occasions, and single Ruddy Duck and Lesser Scaup that have appeared in late autumn or winter. Whooper Swans, up to several dozen, are often present in the cold months, either on the water or in nearby fields. Large flocks of gulls (mainly Black-headed and Common) can be present, but, surprisingly, scarcer species like Glaucous or Little Gull have apparently not been recorded. Several hundred Lapwing, and fewer Curlew, are present every winter and flocks of Golden Plover sometimes feed in adjacent fields. At times, large numbers of both waders and wildfowl fly in at dusk, to roost overnight, probably including birds from other lakes and from the River Suir around Coolfin. Also worth searching for in winter are Chiffchaffs, which have been seen in December and January feeding in the lakeside scrub. Much larger numbers of warblers are present in spring and summer, when a dozen or more pairs each of Sedge and Willow Warblers breed, their song territories spread right around the lake among reeds and willow scrub. Ballyshunnock can also be a good site for Grasshopper Warblers . A good range of other passerine species, including Redpolls, Whitethroats and Goldcrests, also breed. From July onwards, large numbers of newly fledged passerines are present, and the scrub can be alive with young birds. Larger breeding species include a pair (occasionally two) of Mute Swans, several pairs of Little Grebes, Moorhens and Coots, and probably a pair or two of Water Rails. The main birdwatching attraction in summer are Great Crested Grebes, a pair of which have attempted to breed in many years since 1977. However, the nest contents are usually lost to predators, particularly if water levels are low. In the first few years after the reservoir was created, water levels often fell dramatically over the summer, due more to ground seepage than lack of rainfall. In some autumns all that remained was a small channel of water running through hectares of mud. Although such conditions were bad for breeding waterfowl, the large expanse of mud provided very attractive feeding areas for waders flying over in the autumn. Species such as Little Stint were much more frequent here in the 1970s than recently, and in 1973 the muddy margins produced Waterford’s first North American wader, a Buff-breasted Sandpiper. More recently, water levels have tended to drop more gradually, producing drier and more vegetated margins. However, there are almost always a few patches of wet mud, and these are well worth scanning for the occasional Ruff, Greenshank or other species. Common Sandpipers are the most regular passage wader, and Ballyshunnock is also a good site for Green Sandpiper.